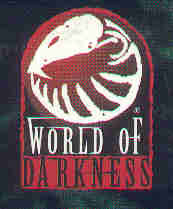 All credit regarding the World of Darkness games goes to White Wolf Game Studios. All properties and trademarks of White Wolf Game Studios are just that. Theirs, not mine. I'm just the guy who throws the dice around, okay? Now shut up and play. Welcome to the Entryway, a gateway to the World of Darkness Play-by-Email games hosted and enjoyed by our circle of friends. Our present Storytellers include Seth Archmagus and me, Tritonius. Click any game's banner below to continue. curious visitors have arrived here to date. The five figures--four male and one female--sat around a heavy oaken table which had come from the estate of a Spanish noble more than three-hundred years before. Its smooth and lacquered surface had darkened with age yet had lost none of its quality. On the tabletop were arranged a set of maps detailing the greater extent of California. For many hours the men had shared information, reports, rumors and--from time to time--veiled threats in an attempt to decide an acceptable course of action. The Sabbat had seized many of the cities near the Mexican border while San Diego, last city of the Camarilla in the South, was under constant siege. The Anarch Free States had been dealt a severe blow in their failed coup of San Francisco but had also shattered the Camarilla's hold on the city. Now with all three factions involved, the City by the Bay was racked by power struggles. Meanwhile, the Camarilla attempted to contain the encroaching Sabbat and Anarch factions while retaining control of the enormous wealth and power of the Golden State for themselves. Two of the four men were Princes, the rulers of the Camarilla fortresses of Las Vegas and Sacramento. The other two men were Archons, both well-versed in the politics, intrigues and battlefields of California. Yet as powerful as these men were, they all deferred to the female, Justicar Lucinde herself. Finally, after much debate, one of them, the Archon Quincy MacIntyre, tapped the map as he spoke. "If Sacramento falls, California will be lost. However, I have an idea which might arrange some more time. Daring and risky, but it may just be the edge we require." The Archon tapped the map thrice as he outlined his plan to those assembled. Finally, Justicar Lucinde nodded her assent. The plan would proceed, but to what end, only time would tell. The emerald sigil flickered sharply as Morgandy lowered the gilded conch into the basin. While continuing to recite the ancient text aloud, Raubritt gestured to Dharvo and Corizelda in turn. The sibilant clacks of the shells sliding into their places at the corners of the stone-wrought triangle echoed sharply through the half-lit watery depths as, high above, the returning party of Arielian, Thorn-Pike and Baroness Ulffrau descended with the collosal skull of Rorqual Atlan-Heraqurn, grown thick with generations of coral croppings and barnacles. Even the streetways of Atlantis seemed to glow softly in welcome as the whale skull neared the spire, to pave the way for the finishing touch of the Rite of the Sea-Horror's Eternal Slumbering. And then, the placid moment of impending triumph was abruptly shattered. The entire sunken city shifted with a sudden and mighty tremor from beneath. Raubritt was hurled from the lectern with the violent tilting of the entire plaza, and the skull-bearers darted away quickly once the coral spire began to unstably totter to and fro. Arielian struggled to maintain his grip on the jawbone as the baroness' hands slipped free of the cables; Thorn-Pike found himself held fast beneath by the force of the sudden plummet. Even his brawn was unable to bear the mass of the skull alone. "I...I can only offer my apologies to you and yours, Dharvo," the Kiasyd uttered darkly through the brine while rising slowly from the cobblework. "But it appears that the Tremere envoy has deceived us. We are too late to prevent the awakening...." Another quake dropped him to his knees, and the sea-folk steeled themselves against the swirling currents as the fallen island beneath Atlantis separated from the ocean floor and began to move. Raubritt shook his head gravely and continued. "It seems that we were wrong, seasinger. Very wrong. But if nothing else, take solace in knowing that we are now aware of what sank Atlantis...and what is now bringing her back to the surface world." A collapsing crystal ballustrade struck Morgandy from the dais. Looking up from where she sprawled, her tendrils twisted with anxiety as, away in the dark distance beyond the edges of Atlantis, she spied a myriad of black, chitin-plated tentacles bursting through millenia of Atlantic sediment and snaking upwards toward the light like a writhing curtain of infernal kelp. Stoically, Raubritt pocketed the eelskin parchment and lowered his gaze. "Atlantis drowned, but her host still lives." "...so sayeth the Book of Humanity's Close. As it is written, so shall it be." And the brass bell pealed twice. Jebediah and Jezebel drew their backs together as the five sinister adversaries cast down the lids of their sarcophagi and crept nearer. Raising their hands in supplication to some dark elder god, they seemed to join Jebediah in his dark incantations against them. Jezebel slipped two more cartridges into the open breach of her shotgun, staring down the hollow eye sockets of her skeletal doppelganger all the while. And with the skeletal clones of herself and of Jebediah she recognized those of their felled comrades and allies: Ezekiel, torn asunder by the shadow-horrors from Erebus. Azrael, ensnared by Simon Meridius' sorceries; What revelations became sweetly clear to his tortured mind as his body swiftly and horridly decomposed with his soul and his lifeforce still trapped in it? And Detective Farland...only the Old Ones know what greeted him as he stepped through that nihil. And now these doppelgangers all slowly paced the circle around the two and continued their ominous chant, each speaking in turn. "...All that was shall be forgotten." "All that is shall be undone." "All that will be shall never come to be...."
"I'll be damned if you get your way tonight, boneheads." snarled Jezebel. She failed to notice the appropriateness of her choice of words. And from each eye socket of each skull issued forth a cold black flame, growing and billowing as the chanting reached a crescendo. Jebediah, raising the weeping Sanguine Vein-Staff, brought his own chant to its conclusion. "...asceraddo il veritanamos, exulsis il tan betrachura dan Baal berith!" The skeletal mimic of Ezekiel was then broken against the blackrock buttress in an ear-splitting shriek of foul ghost-wrath which drowned out even the twin report of Jezebel's shotgun dismantling the rib cage of her undead counterpart. And thus was the grim battle joined in earnest.